SAN FRANCISCO — President Trump boasted Friday of his social media influence after his personal Twitter account was briefly deactivated by a departing company employee, raising serious questions about the security of tweets the president wields to set major policy agendas, connect with his voter base and lash out at his adversaries. The deactivation Thursday sparked deep and troubling questions about who has access to the president's personal account, @realDonaldTrump, and the power that access holds. The deactivation also came at a time when the social network is under scrutiny for the role it played in spreading Russian propaganda during the 2016 presidential election. Twitter said through an official account Friday that it has put in additional safeguards in place to prevent similar incidents from happening in the future. The company has declined to share more details about its investigation into the incident. 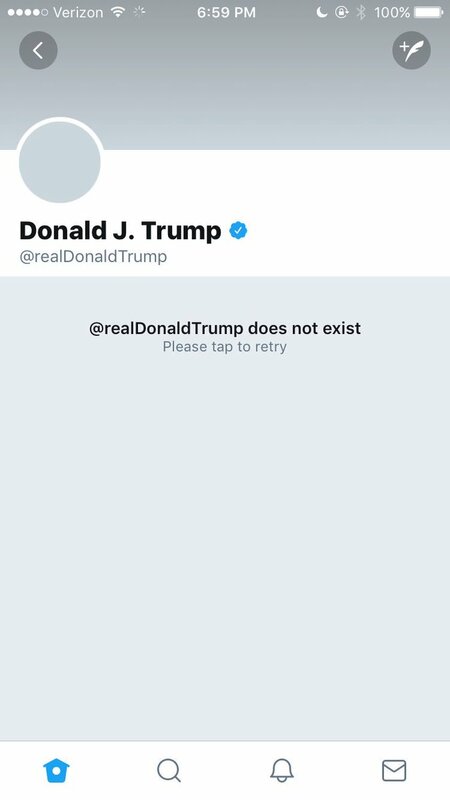 By 7 p.m., it was back, and the Twittersphere began joking about the short-lived window of history without @realDonaldTrump. But two hours later, the company admitted that the deactivation wasn't an accident at all: A preliminary investigation revealed that the account was taken offline “by a Twitter customer support employee who did this on the employee's last day.” Twitter said it was conducting a full internal review. Early Friday, Trump blamed a “rogue employee” for pulling the plug. The company has suspended other high-profile accounts in the past for violating its terms and conditions. But there has not been a case where an employee has acted to take down the account of a well-known person seemingly on their own. A spokeswoman from Twitter said no new information about the investigation would be released Thursday night. It was still unclear who the employee was, how that employee got access to the president's account and whether any security breaches led to the subsequent deactivation. “A lot” of employees at Twitter can suspend a user’s account, a former employee of the company told BuzzFeed. But far fewer — only hundreds — have the power to deactivate one. There was some discussion at the company about special protections on verified or high-profile accounts, but that extra measures were “never implemented,” the unnamed source said. On Twitter, some people made light of the deactivation, while others wondered about the potential consequences of employees who have access to an important megaphone used by the president of the United States. I'm surprised that people think it is a good thing that a single employee can kick you off the Internet, but I guess I shouldn't be. Trump has used the account since March 2009. He has tweeted more than 36,000 times and has 41.7 million followers. His use of the social media platform is no trivial matter. The National Archives has advised the Trump administration to preserve all tweets as presidential records, and a professor at the U.S. Naval War College is worried U.S. enemies could be using Trump's tweets to build a psychological profile of the president. Recent @realDonaldTrump tweets about North Korea heightened tensions between the two countries, with Trump threatening that “they won’t be around much longer!” and that “only one thing will work!” In the past, officials in Pyongyang have responded to Trump’s tweets as declarations of war. In September, Twitter defended its decision not to remove a controversial Trump tweet that some interpreted as a threat directed toward North Korea. Twitter's rules prohibit violent threats, some users pointed out, arguing that the Trump tweet fell into that category. It was Twitter's clearest explanation for its stance toward Trump, despite repeated calls from some users for the president's account to be banned. Earlier this year, Kal Penn, the actor and former aide to President Barack Obama, urged Twitter to take stronger measures after Trump warned North Korea that the U.S. military was “locked and loaded.” On another occasion, Trump tweeted a video of himself beating somebody up outside a wrestling ring, with the victim's face obscured by CNN's logo — giving the impression that Trump was physically assaulting the news network. Trump recognizes the power of the social platform. A tool once used by a campaigning candidate to disparage his opponents and rally his supporters is now Trump's favorite online means of promoting his presidential agenda. “Twitter is a wonderful thing for me because I can get the word out,” he told Carlson. As president, Trump has continued to use Twitter as a weapon: He repeated his “bing, bing, bing” explanation in a recent interview with Maria Bartiromo of Fox Business Network, and explained why he finds it such an appealing outlet. Bartiromo asked Trump if some of his unscripted tweets get in the way of the larger message his administration is trying to sell. Trump acknowledged that he has friends who tell him not to use social media. But, he said, it’s a very useful tool to counter “fake news” and respond to critics. “I can express my views when somebody expresses maybe a false view that they said I gave,” he said. Trump — whose tweets sometimes contain spelling errors and randomly capitalized words — also relayed that he thinks he is well-suited for the medium. The deactivation controversy comes at a time when Twitter and other technology companies are under greater scrutiny for the way they can be abused. Earlier this week, lawyers from Twitter, Facebook and Google testified on Capitol Hill as part of the investigation into Russian attempts to influence the 2016 presidential election. In public statements, Twitter acknowledged that it had identified 2,752 accounts controlled by Russian operatives, as well as more than 36,000 bots that issued 1.4 million tweets during the election. On Thursday, Trump used his account to congratulate the Houston Astros for winning the World Series, call on Congress to “TERMINATE” the diversity visa lottery program and announce the nomination of Jerome Powell as the next chairman of the Federal Reserve. Trump was back tweeting at 8:05 p.m., praising the day's “Great Tax Cut rollout” before taking aim at some of his adversaries. Before daybreak Friday, he was back at it, launching a tweetstorm about Hillary Clinton, the Democrats and the Justice Department. Siegel and du Lac reported from Washington. John Wagner, Avi Selk, Brian Fung and Brian Murphy contributed to this report, which has been updated. He didn’t like the ‘energy’ at his Airbnb. Now his housemates are charged with his murder. What Russian Facebook ads would you have seen? Take a look.